This recipe originally is from Egg Whites International and Jen reposted it on Jen’s Fit Playground and here I am re-reposting it because it’s so good!! But sounds so gross, right? Whisk together flour, 3 tbs of Xylitol, and milk in a small saucepan. Heat over medium. Continue stirring and add peanut butter. When melted remove from heat and add vanilla. Meanwhile combine remaining Xylitol, Cream of Tartar, and egg whites in another bowl. Using an electric mixer beat on high for several minutes until stiff peaks form (THANK YOU KITCHEN AID STAND MIXER!). If they fail to form add a small amount more of Cream of Tartar. Fold egg mixture in to peanut butter mixture. 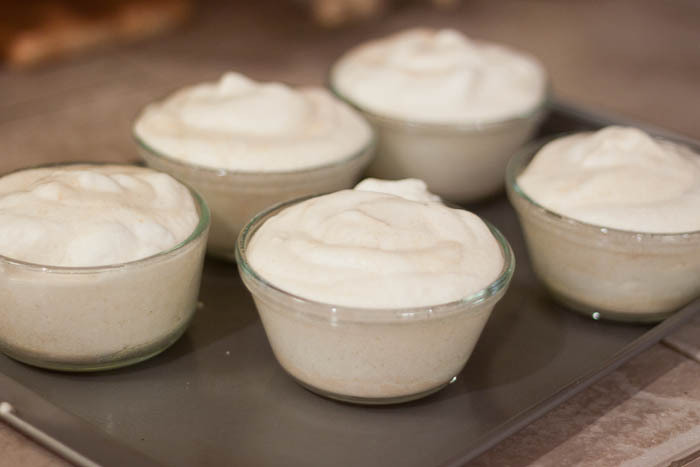 Spray 7 oz ramekins with cooking spray. 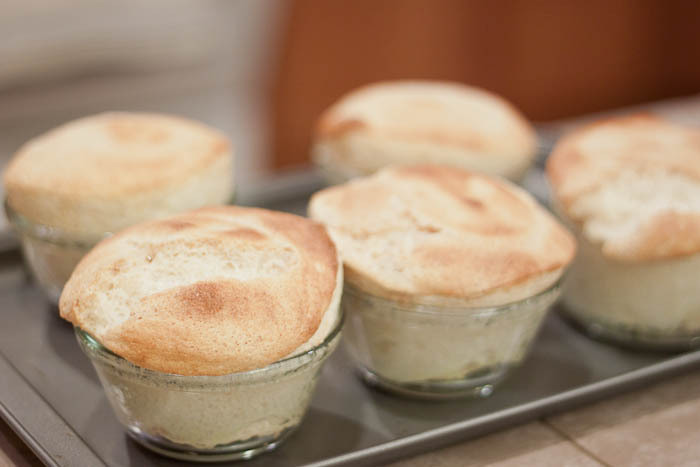 Pour equal amounts of soufflé batter in to each. Bake in preheated oven for 12-15 minutes. Remove from even and let cool slightly before serving. **Note: I actually cannot find this, apparently Trader Joe’s use to carry it but I used PB2 instead. If you use PB2, I would cut the Xylitol from 3 Tbsp to 2 Tbsp in the first step. When using the PB2, these were REALLY REALLY sweet, like my saliva glands went into overdrive when I ate one of these but I’m not sure how sweet they are if you just use peanut flour. If anyone can find peanut flour, LET ME KNOW! My husband did not care of the texture at all and I wasn’ a fan at first, but if you are looking to curb your sweet tooth, these are awesome. I usually made these part of my bedtime snack. These are better when warm, so I covered them in plastic wrap and put them in the fridge and when I was ready to eat one, I put it in the microwave for 22 seconds.